The Era, 26 February 1860. 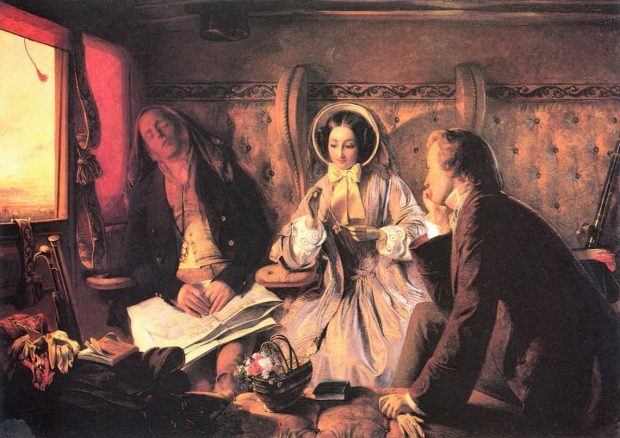 First Class by Abraham Solomon, 1855. Some passengers managed to escape from their carriages. Others were not so fortunate. The 21 February 1860 edition of the Morning Post reports that Mr. Barber, a young fireman on board, was “smashed to pieces,” while the engine driver, a gentleman by the name of William Rowell, was both crushed and scalded when water and steam discharged from the upended boiler. Rowell also suffered a severe head injury. The Era relates that “from the moment he was taken from beneath the engine he never for a single instant recovered his consciousness.” Rowell would expire from his injuries later that evening, leaving behind a wife and several small children. The Railway Station by William Powell Frith, 1862. Removing the injured from the train was both a lengthy and a very delicate undertaking. The Morning Post states that, in order to extricate the passengers, the carriages first had to “be broken into fragments.” Once removed from the wreckage, the injured were then either “conveyed into the waiting rooms at the station” or carried to nearby taverns on makeshift stretchers fashioned from boards and ladders. Another fatally injured passenger was a man named Mr. Satchell. Described as being a hatter from Fenchurch Street, he was also taken to the White Hart Inn where he later expired from “the dreadful nature of his injuries.” In the end, the derailment would claim the lives of seven passengers who either died at the scene or shortly thereafter. Non-fatal injuries ranged from crushed legs and dislocated hips to bruises, burns, and compound fractures. One gentleman named Mr. Manston, a miller from the town of Hoddesdon, suffered a compound fracture of the left leg which was so severe that he was forced to undergo an amputation at a neighbouring tavern. 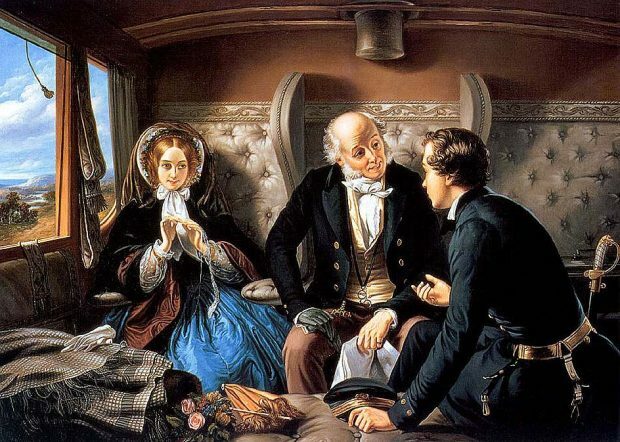 First Class – The Meeting: ‘And at First Meeting Loved’ by Abraham Solomon, 1855. The Morning Post reports that railway officials would later confirm Owen’s findings, determining that the derailment had been caused by “the breaking of the tyre of the left leading wheel of the engine.” Though tragic, it was believed to be purely accidental. The Tottenham railway disaster was not the first derailment of the Victorian era, nor would it be the last. I focus on it in this article because it is mentioned briefly in my upcoming Victorian romance novel, The Lost Letter. In the aftermath of the derailment at Tottenham station, one of my characters forbids his wife from travelling by train. This reaction is not wholly unreasonable in light of the catastrophic nature of the crash. People were shocked and frightened and, though a horse and carriage was not really much safer, an overprotective spouse might temporarily consider it a better option than a runaway locomotive. Cambridge Independent Press (Cambridgeshire, England), 25 February 1860. The Era (London, England), 26 February, 1860. Lloyd’s Weekly Newspaper (London, England) 26 February 1860. Morning Post (London, England) 21 February 1860. Thanks, Cynthia :) I’m glad you enjoy my site! Very interesting article about a subject we still deal with today and some of us have the same reaction as that husband, at least for a little while. And I love the pictures you chose to accompany the article. Thanks, Laurie :) I’m so glad you enjoyed it! The early days of commercial air travel when planes went down with startling regularity no doubt conjured similar feelings in spouses. Lovely article. I’m glad you enjoyed it :) And you’re too right about the early days of air travel. It amazes me that we all persevered!